It`s great to be able to fully concentrate on the task at hand while waiting for a future task to be ready for action. Free Countdown Timer can remind you about important events by playing your favorite music and showing a notification message. It`s great to be able to fully concentrate on the task at hand while waiting for a future task to be ready for action. 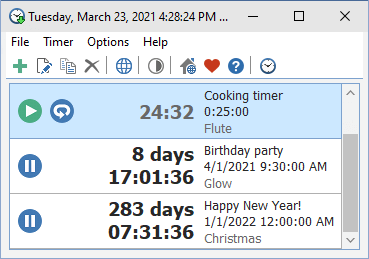 Free Countdown Timer can remind you about important events by playing your favorite music and showing a notification message. The countdown clock supports unlimited number of timers so that you are not restricted to the number of alarms you can have. Timers that you set will sound even if computer goes to sleep.